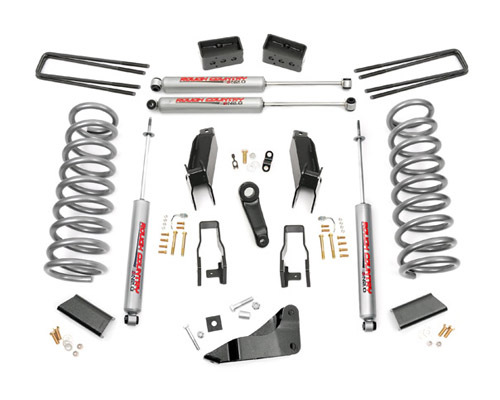 This 5" kit now includes Rough Country's critically acclaimed N2.0 Shock Absorbers at no additional cost! The new N2.0 shocks are custom tuned specifically for this application - meaning you get a shock designed specifically for the weight and maneuverability of your truck. Incorporating "Velocity Sensitive Valving" technology, these shocks utilize a 10-stage variable valving process that allows for a super smooth highway ride and outstanding control in rugged off road situations from the same shock, with no need for further adjustment. Featuring a brand-new control arm solution, the new Dodge 2500 Control Arm Drop Bracket System improves driveline geometry. By utilizing a set of beefy drop brackets we've eliminated the steep mounting angle often seen on 5" and larger kits. By mounting your stock arms to the reduced angle provided by the Drop Bracket System, you'll gain better ride quality and better caster angle for increased drivability. Front: Lifted coil springs, sway-bar drop brackets, track bar brackets, control arm drop brackets, pitman arm and hardware. Rear: 4" fabricated lifted blocks, u-bolts and hardware. Works with factory 17" / 20" wheels.